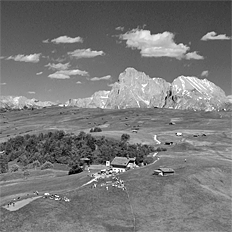 The flight starting from Spitzbühel on Alpe di Siusi is classical. Paragliding pioneers started more than 25 years ago from there, but their flights did not lead far: the ancient parasails just reached the nearest landing area... The develpment of safe and efficient parasails during many years now allow a relaxed flight, just enjoing our sightseeing flight above the village of Castelrotto and its meadows. Before our take-off you can see the amazing panorama of Eisack valley and the mountains around us. You can almost touch the mountain Schlern with Santner's peak. 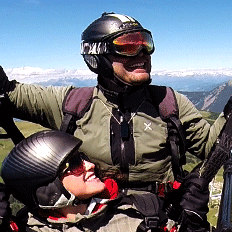 Family members and friends have the possibility to watch and experience your paragling tandem flight from Spitzbühel. On the sunny terrace at Restaurant Spitzbühl you will not stay hungry and enjoy the wonderful mountain panorama of Mount Schlern. You will live for this moment. A day of hiking on Alpe di Siusi can be combined perfectly with a paragliding tandem flight. Relaxed parasailing to the village in quietness will be the highlight of your day.